This little red speedster is rather local in distribution and is present in preferred habitats in the vicinity of its caterpillar host plants. The male is a bright scarlet red with black apical area above, whilst the female is a drab brown. The underside is grey with the usual Rapala striations on both wings. The hindwing features a white-tipped filamentous tail at vein 2. 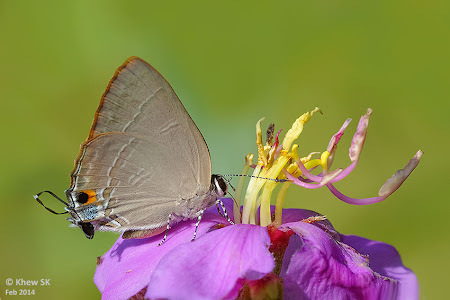 The flower of the Singapore Rhododendron (Melastoma malabathricum) does not appear to be very attractive to butterflies, perhaps due to the structure of the flower or the quality of the nectar. 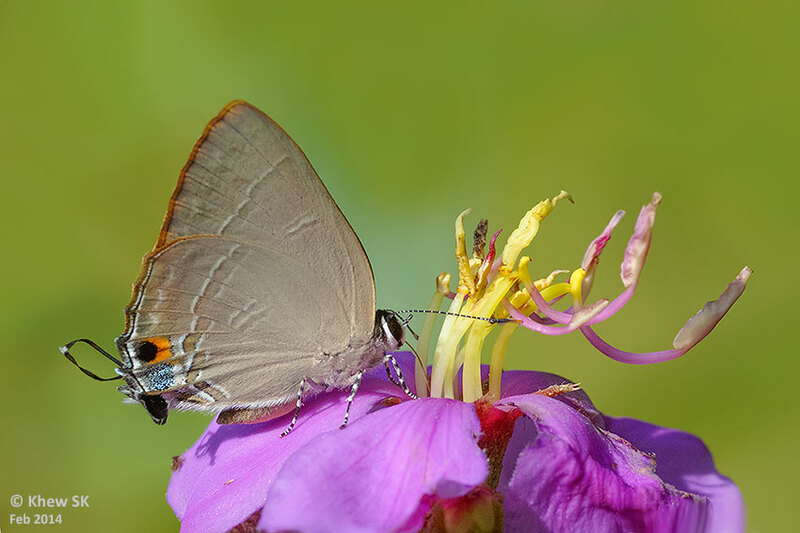 In the field, butterflies do not appear to prefer feeding on the nectar from its flowers, compared to other favourites like the Lantana, Ixora or Leea flowers. This is one instance where a butterfly, in this case a female Common Red Flash, probes its proboscis into the flower of the Melastoma to feed. The primary feeders/pollinators of the Melastoma appear to be predominantly bees and wasps, rather than butterflies.